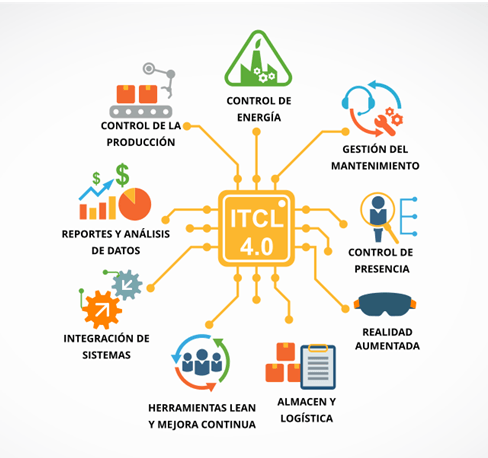 ITCL has more than ten years of experience in digital transformation for companies, combining state-of-the-art technology with management systems and continuous improvement methodologies. Our mission is to help the company identify opportunities for improvement based on the knowledge of its processes and create value through the interconnection of all its areas. Our digitization support strategy focuses on 8 areas that can work together but deliver great value independently. All our developments are flexible allowing us to customize the solutions to the needs of the company and are prepared to work in the cloud. We have implemented production monitoring systems in more than 70 companies in different sectors. We digitalize the information of automatic, semi-automatic or manual processes through the use of IOT sensors, operator panels, machine PLCs, etc. Our systems are transparently connected to ERP systems, BI databases or others in a bidirectional way, to enrich production information and thus obtain a real-time image in any device, the productivity and efficiency of processes and Support decision making production. The work of one of the research groups focuses its activity on the efficient use, monitoring and control of energy in productive processes. All that knowledge and experience has been transformed into a system of monitoring and control of energy that allows a detailed view of the consumptions of the processes and their optimization. In addition, this tool is connected to other tools such as production control, maintenance management, etc. As an integral part of the digitization of the processes and data of the company, we have a maintenance management system integrated with the production and energy systems. In this way the company can plan and optimize its maintenance processes, reducing the impact on production. In addition, with the help of this solution the company will have a tool for the identification of breakdowns, risks, trends, etc. LDigitalisation of the company involves an enormous amount of data and the efficient management of this data and its treatment are key tools to make the information a competitive advantage. Each of our solutions have data processing tools, display indicators etc. In addition, we can connect our solutions to other data sources to obtain KPIs that combine production, energy, maintenance, planning (ERP, CRM) data, or any indicator that is key to the business. We also develop artificial intelligence algorithms for the efficient use of data and advice for your Big Data needs. All our solutions seek to integrate the knowledge and data of the company into a global tool that provides the company with an integrated vision to support strategic decision making about its processes and products. We can connect our solutions to the databases of other company tools in order to extract or provide information of high value to the different levels of the company. For example, extracting ERP manufacturing orders, transferring it to the on-site operator panels and moving the production information back into the ERP for more detailed product cost control. One of the pillars of our solutions is the prior study of production and business processes. Together with the digitization we offer a diagnosis of the processes and an accompaniment in the continuous improvement of them. The information provided by the production control, maintenance, energy, etc. tools serve as indicators of productivity and process efficiency, which can be used as indicators of improvement opportunities and their effect. One of our greatest values ​​is to pool Lean and digitization to converge in high value solutions that increase the efficiency and competitive advantages of companies.